Improve the overall appearance of your skin with Erbium Laser and CO2 Laser resurfacing at The Langdon Center. Each of these lasers have specific advantages and when combined, Erbium and CO2 laser resurfacing result in a smoother, tighter, younger-looking complexion. 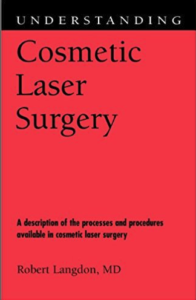 Dr. Langdon has written extensively about both of these lasers in his book Understanding Cosmetic Laser Surgery. The Erbium Laser can be used for facial resurfacing on various areas of the face. The Erbium laser in Guilford provides impressive results because it can be safely used to resurface even deeply wrinkled skin around the mouth and eyes. During the treatment, the sun-damaged tissue is removed and, with healing, is replaced with a new, fresh layer of skin. Recovery after Erbium Laser resurfacing is typically one week or less. The CO2 Laser at The Langdon Center is used most commonly to treat moderate to severe sun damage and acne scars, as well as sagging skin and deeper wrinkles. 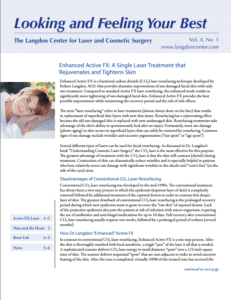 The Langdon Center offers three types of fractional CO2 Laser treatments for each patient’s needs. ActiveFX is a superficial fractional treatment that reduces fine lines and improves uneven skin tone and age spots. DeepFX is a more powerful and focused treatment that improves the appearance of deep wrinkles and severe acne scars. TotalFX combines ActiveFX and DeepFX for overall improvements in tone, texture, wrinkles and scars. In addition, Dr. Langdon is an expert in conventional CO2 laser resurfacing, a non-fractional treatment that covers the entire skin surface. These treatments can provide the most dramatic improvement of all, especially in patients with severely photo-aged skin. Combining Erbium laser with CO2 laser resurfacing will result in ultimate skin rejuvenation. The Erbium laser can be used to safely resurface deeper wrinkles, whereas the CO2 laser can be used to provide impressive tightening of treated facial skin. Call (203) 745-0340 for an Erbium Laser Treatment and CO2 Laser Treatment consultation at The Langdon Center in Guilford, CT.